The HS-322HD Standard Heavy Duty Servo utilizes Hitec’s revolutionary Karbonite™ gear train which is four times stronger than our standard white nylon gears, and even after hundreds of thousands of cycles they don’t show any signs of wear. Karbonite™ gears and our custom IC make the HS-322HD a great choice for an economical sport servo. This is Four times stronger than the standard white nylon gears. 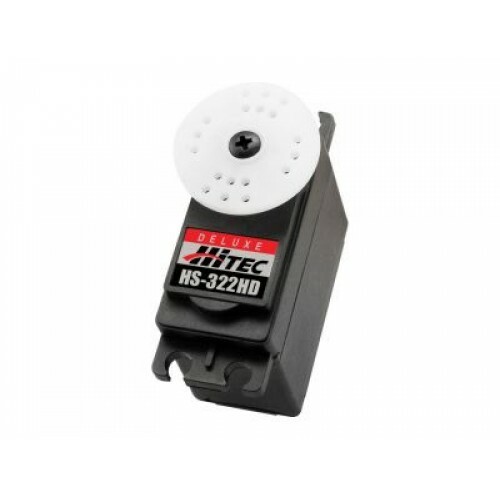 HITEC AUTHORIZED INDIAN DISTRIBUTOR Use this Servo for your power & sail planes, cars, sail b.. This servo is Discontinued/Retired - Replaced by HS-485HB (Click Here) HS-485HB updates.. The Deluxe ball bearing HS-430BH is our budget-minded analog servo capable of 6.0 to 7.4 volt operat.. The Hitec HS-635HB utilizes the revolutionary Karbonite gear train. Karbonite is four ti.. The Servo Controller allows you to control up to 16 servos (32 using two Servo Controller.. Looking for a feature packed radio for your car or boat? Then take a look at the 2.4GHz SRX Pro. Thi..